Inspiring Curitiba: 20 photos that will make you want to visit Curitiba! A picture sometimes can tell more than 1.850.775.594 words! Considering this, we have selected 20 pictures to show a little bit of our amazing and famous Curitiba… and show you why you should put Curitiba, Brazil on your travel list! Inspired on the French gardens, the Botanical Garden of Curitiba is a famous postcard-picture landmark of Curitiba. The gorgeous greenhouse attracts many tourists and researchers from all over the world due to its exotic and wide collection of tropical and sub-tropical flora and fauna. Gorgeous! It is Curitiba’s main sightseeing place! The amazing Oscar Niemeyer Museum is definitely another famous postcard of Curitiba. Designed by the famous and globally recognized Brazilian architect, Oscar Niemeyer. Its fabulous “eye” shaped architecture, beauty, size and collors will get you really impressed! The Universidade Federal do Paraná or Federal University of Paraná (UFPR) was established in 1912 and it is the oldest brazilian university. It is considered one of the best and hardest universities to get accepted in Brazil. In the picture bellow you can see the historical building, the official symbol of Curitiba, located just in front of the beautiful Santos Andrade Square. Ukrainian Memorial is a very interesting and beautiful place to visit in Curitiba. Located at Tingui Park, the Ukrainian Memorial was built in honor to the important Ukranian heritage in our State. 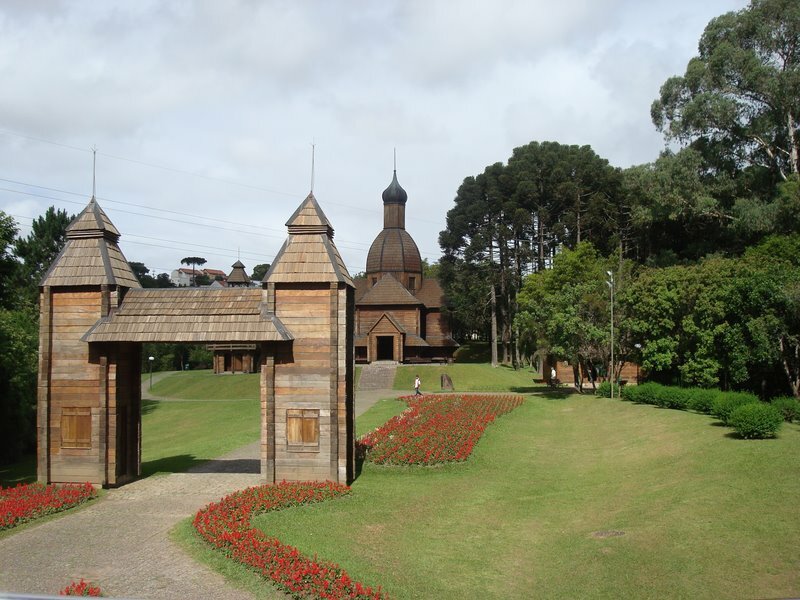 The church of the memorial is a replica of a church that exists in the countryside of Paraná State and also holds an interesting pêssankas, images, pictures, icons exhibition. Paço da Liberdade is a lovely place to stroll and visit in Curitiba. The beutiful building with neoclassical details and art-nouveau drawings was built in 1916 and used to be the headquarters of the old Curitiba City Hall and Paranense Museum. Its was revitalizated in 2009 and all the details were carefully preserved. The place currently belongs to SESC and it is a great cultural, musical and artistic place counting with library, bookstore, a charming coffee shop, movie theater, music studio, computer lab, exhibition rooms, etc. One of the best and most famous parks in Curitiba, Tanguá Park was built over two disabled quarries and covers a total area of 235 thousand square meters. The park is also part of the project to guarantee the preservation of the Barigui River. Besides the lakes, its artificial waterfall and tunnel attracts many visitors and it is possible to across it by foot or boat. The park has also a harbor, bike lane, race track, snack bar and parking lots. Go to Tanguá Park in the late afternoon to enjoy a amzing sundown. Located at Tiradentes Square, the beautiful Catedral Basílica Menor de Nossa Senhora da Luz of Curitiba was built from 1876 to 1893, in neo-Gothic style, inspired in the Igreja da Sé of Barcelona. The Cathedral is dedicated and has an image of Nossa Senhora da Luz dos Pinhais, Saint Patron of Curitiba. It was founded on March 29th, 1693 and it is considered the most important construction on Tiradentes Square. The old town of Curitiba, also known as Largo da Ordem or Historical Center used to be an area of intense commerce of the city. Nowadays, the area is more known by being an historical, cultural and artistic area of the city because of its old architecture of its houses, buildings and churches, such as historical monuments, artistic panels, cultural places, art galleries, bars, restaurants, etc. Every Sunday, the famous Handcraft Market or “Feirinha do Largo da Ordem” attracts a lot of locals and tourists to Largo da Ordem! Very exciting! The traditional and lively Handcraft Market or “Feirinha do Largo da Ordem” is held here every Sunday from 10h to 14h and it is a meeting point for locals and tourists. It was created in 1973 and is currently the second largest craft fair in Brazil! At the feirinha you can find and buy so many cool, different and interesting stuff that are made and sold by over 1,350 artisans and sellers. It is the best place to buy souvenirs in Curitiba. Do not miss it!!! The Wire Opera House was inaugurated in 1992, in the Quarries Park, close to the Cultural Space Paulo Leminski, the Wire Opera impresses visitors for its tubular structure and transparent polycarbonate roof construction. It has capacity for 1,640 spectators and a 400m² stage to host artistic and cultural presentations. The external area of the Wire Opera is also spectacular. In the place of an old quarry, visitors can appreciate the native forest that surrounds it, lake with many fishes, several species of birds and a of 10 meters cascade. If you have the opportunity to watch a play or a concert, you must do it! Created in 1972, Barigui Park is one of the largest and oldest parks of Curitiba. The park received the same name of the river that was dammed to form the lake of the park. Several species of wild animals live in the park, as birds, capybaras and small rodents. Lots of people frequent the park, especially before and after work on weekdays, and along the whole day and beginning of the night, on Saturdays, Sundays and holidays. The park also offers an excellent infrastructure counting with cooper track around the lake and other parts, walking and running lanes, outdoors equipments for gymnastics, barbecue grill kiosks, basketball, soccer and volleyball courts, exclusive lanes for bicycles and skateboards, bars, restaurants, etc. On beautiful and sunny days, Barigui Park is a great leisure and entertainment option for many tourists and locals, mainly the young ones. Built in 1991 by the state-owned company Telepar, the tower belongs now to Oi. The tower has 109,5 meters of height and it is the only Brazilian telephony tower with a observatory open for visitors. From the observatory you can have a spectacular 360º panoramic view of Curitiba. The telephone museum tells the history of the telephony is very interesting and also attracts lots of visitors to the tower. Great place to visit in Curitiba! A tribute to the German immigrants, the German Woods or Bosque Alemão covers an area of 38,000 sq m and it is a delight for children, who particularly enjoy the Hansel and Gretel House and the Philosopher’s Tower. From there you can get a fantastic view of Curitiba. The German Woods also house a wooden neogothic church, dating back to 1933, with a concert hall aptly called Bach’s Oratorium. The park has other attractions that include a library for children and a German Poetry Square with a replica of an old German building called the Casa Mil. One of the most important Curitiba parks, Bosque do Papa or Pope Woods is a beautiful park to stroll and relax in Curitiba! The park was created in honor to Pope John Paul II and to the great Polish community in Curitiba and it bases the Polish Immigration Memorial. There are seven original wood houses in the center of the forest illustrates the architecture and way of living of the Polish immigrants of Curitiba. Besides a statue of Pope John Paul II, the park has also a craft store, Polish coffee shop (delicious cakes! ), Polish houses and still offers a vast green and arborous area, trails, playground and bike lanes. Tiradentes Square is the oldest one in town! It is considered the point where Curitiba was born and started its development. This famous square was remodelled many times over the years, but since its last reformulation in 2008 partially recovered its history, renewing its walks and benches. A new glass floor gave an extra charm to the square! Passeio Público was the first public park created in Curitiba, on May 2nd of 1886. Its a great ileisure area containing lakes, bridges, small and a big green area in the middle of the city. The park also houses many especies of birds and monkeys. Its gate is a copy of the Paris Dog Cemetery gate and give even more charm and beauty to the park. Great place to see and stroll in Curitiba! Curitiba developed a non subsidized, private owned, public transport system called BRT (Bus Rapid Transit) that today is a model internationally recognized. Insightful, long term planning with several innovative solutions has provided the citizens with an effective system that gives priority to public instead of private transport. Besides being model in public transportation and urban planning, Curitiba is also considered the ecologic capital of Brazil. In the middle of the green Bosque Zaninelly, the criation of the Free University on the Environment or Universidade Livre do Meio Ambiente – UNILIVRE made Curitiba to be recognized as the first city in the world to have a special place for studies and wide dissemination of environmental and ecological knowledge to the public. The architectonic project of the university is VERY interesting!!! Built in 1906, the old gunpowder storeroom of Curitiba was transformed into a charming theater with capacity for 225 people. The Paiol Theater was inaugurated and honored for Toquinho and Vinícius of Moraes, in 1971, with the music “Paiol de Pólvora”.